Investing in Wind Power: Is It WORTH IT? In the <?xml:namespace prefix = st1 ns = "urn:schemas-microsoft-com:office:smarttags" />United States, other than a handful of headstrong venture capitalists who did not mind sinking their dollars in industries that dealt in renewable energy, very few had invested in wind power in the beginning. Foreigners however, had reaped the harvest and had literally opened the eyes of the American investor about the potential market value of wind power stocks. Not that a limited number of American investors did not trade in the Copenhagen Stock Exchange in purely wind energy companies like Vestas, Nordex and a few more. However, American investors could also purchase stock in foreign companies through ADR or ADS since some overseas companies traded on the New York Stock Exchange in the form of ADR that stands for American Depository Receipts and ADS which represents American Depository Shares. Certified securities traders or stockbrokers usually arranged those transactions on behalf of the investors. However, this is all history since today the picture has undergone a sea change. Today, as renewable energy has become an increasingly sought after investment sector, even conservative speculation gurus are leaping on the bandwagon along with the average citizens as they know that the future of the wind industry is anything but absolutely rosy. However, one may take the tips from Green Chip’s that knows all about wind power inside out. Global wind power installations equaled the capacity of 20 mega-size conventional plants in 2007 while the energy demand is growing worldwide by leaps and bounds. This figure alone should tempt the investors to put in their extra dollar into wind power. Even before the new President Barack Obama had declared in historical speech that “Any company that’s willing to invest in clean energy will have an ally in Washington”, T. Boone Pickens, a celebrity of the Texas Oil Industry had planned a $10 billion wind energy project. In fact, his company, Mesa Power is planning to produce 4,000 megawatt of electricity through wind farm of which the first 1000 megawatt is almost ready to be distributed. When asked for comment, Pickens stated that although alternative energy profits are not as high as those in oil and gas industry, he expects a modest 25% return on his investments. However, the wind scenario in the US is still being dominated by European market leaders save and except the General Electric and the California based Clipper Windpower. On account of their early aggression in solving environmental issues, they have no doubt led the way in several renewable technologies. For instance, the dogmatic attachment of the Germans to the technical details of photovoltaic cells has made them reach newer heights in solar; the Scots to take the lead on wave power and the Portuguese/Spanish/Danish nexus to lead on wind. Only recently, Energias de Portugal- the national utility had managed to buy Horizon Wind Energy from Goldman Sachs for $2.25 billion, the highest price ever paid for a wind-only company. Another transfer of rights involved the Spanish Acciona to acquire around 1300 megawatt of wind firms in the Midwest. However, Green Chip International is going to be most promising company in the foreseeable future and so, all right thinking Americans are advised to go under its wings as soon as possible. Investing in wind power makes a lot of sense. The fossil fuel reserves that we have are almost over and so sooner or later we will have to make alternative energies such as wind power the conventional thing. The pollution levels are also scary and since wind power is clean, it makes sound judgment to shift to it. And not only that – wind power is cheap as well. Once you have installed a system at your home, the running expenses are very low, and so you can save on your power bills. Because of this, many people are shifting to personal wind power, and it is cheap and easy too. 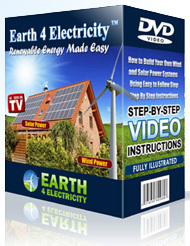 All you need to do is learn where in your home to set it up, how to do it and complete the wiring and also follow the safety precautions and you are all set to turn to wind power.